1. Saute onion, celery, green pepper and garlic in butter just until tender; put into a bowl and stir in sour cream and soup. 2. Combine egg and milk in a small bowl; place bread crumbs and black pepper in second dish. 3. 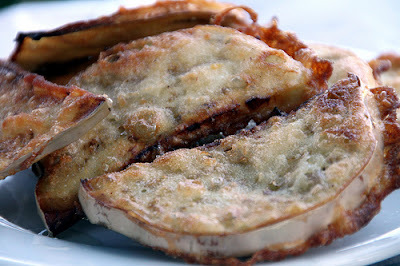 Dip eggplant in egg mixture, then in crumbs; brown each side on medium-high heat (in oil), set aside. Eggplant, Cheese, Ham, Creamy-Veggie mix, Eggplant, Cheese, Ham, Creamy-Veggie mix...top off with more cheese. 5. Cover pan with foil. 6. Bake in moderate oven (350°) about 25 minutes, or until bubbly; uncover; bake for 5 minutes to brown.